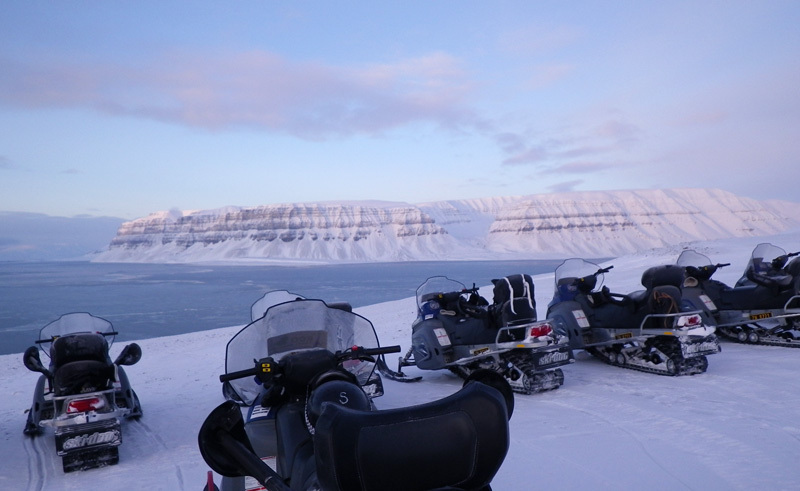 After a briefing, the tour heads into the wilderness on a day trip through easy terrain towards Templefjorden. As you become accustomed to your snowmobile you will pass through the wide Advent Valley, making your way through winding river beds and over wide open plains. During the trip you may spot the local Svalbard Reindeer, and the guide will make stops to point out wildlife, natural wonders and historical sites. One of them is trappers base Fredheim, located on the shore of the Templefjord, where famous Norwegian hunter Hilmar Nois had his base station for well over 30 years. You will see both the earlier cabin, where one of his children was born, and a larger villa which he built for his second wife. Afterwards, should the conditions be suitable head out onto the fjord ice and towards the ragged glacier face of the Tuna Glacier which rises like a blue wall ahead. During the trip an expedition lunch is included before returning to civilisation.